A small Florida-based firm is suing iPhone maker Apple Inc, alleging that handset's new touch-screen keyboard interface infringes on patent claims dating back over 7 years. After writing Apple in late February and receiving no response, SP Technologies, LLC on Thursday turned to a patent litigation-friendly federal court in Tyler, Texas, where it filed a formal complaint against electronics maker. Specifically, the 4-page suit charges that Apple's iPhone keyboard interface treads on four claims outline in an August 4th, 2000 U.S. patent titled "Method and medium for readable keyboard display incapable of user termination." 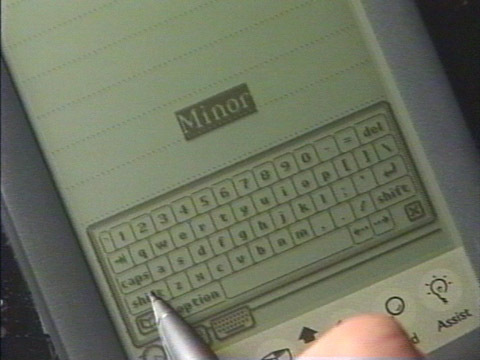 The 7-year-old filing describes a "method of providing a user interface for receiving information from a user using a user immutable graphical keyboard linked to an input area, [...] invoking the graphical keyboard on a touch screen display to receive input from a user, and [...] maintaining the graphical keyboard on the touch screen display such that the user cannot move, resize, remove, or close the graphical keyboard through the user interface while the input area remains and requires input." SP Technology argues that by selling and offering to sell its iPhone through Apple and AT&T stores located in the Texas district, Apple has and continues to commit acts of patent infringement. "Apple?s advertisements, operating instructions and product descriptions direct users to purchase and use the iPhone as called for in the asserted claims," the firm wrote. In return for Apple's "willful and deliberate" infringement, SP Technology is seeking damages adequate to compensate for the number of iPhones sold thus far, as well as a permanent injunction prohibiting the company from further infringement. Apple's iPhone Keyboard Interface (left), A concept drawing from SP's patent (right). Although Apple has yet to formally respond to the suit, chief executive Steve Jobs in January confidently claimed to have patented nearly every aspect of his firm's iPhone interface through a series of more than 200 patent filings. Update: InformationWeek notes that Peter V. Boesen, the owner of the patent in question, is a surgeon who was recently sentenced to 51 months in federal penitentiary for defrauding the healthcare system. "Civil court records show that Boesen, through SP Technologies, has filed a number of patent suits in the past, including claims against Canon, LG Electronics, and Kyocera." In the case regarding the healthcare system, Boesen was ordered to repay the state and private insurers more than $900,000. "Boesen is free pending an appeal," wrote InformationWeek. "No word on whether he is using an iPhone to text his lawyer." Patent infringement is the only way to find out if anything is patented these days. There are so many patents it would take forever to search through them all. Apple can more than afford to be sued. This is a repost from one I made last night on this topic. Here we go again. Another lawsuit by a Florida company, SP technologies, contending an infringement of its 2004 patent. The company claims the patent describes a "method and medium for computer readable keyboard display incapable of user termination." Groan. It's being filed in--you guessed it--Tyler,Tx, the frivolous patent infringement capital of the US. Between blatantly false rumors last week fueled by shoddy reporting on the part of the financial press, ,ensuing Bear raids by Hedge funds and frivolous lawsuits, AAPL is under siege by unethical groups seeking to capitalize on its success. It could use a healthy dose of good news this Tuesday. In this jittery market stoked by FUD masters (we even have at least one on this board), these incidents are insidious. Wow, a patent for an on-screen keyboard. I think I'm going to file a patent for all kinds of edible material made from plant matter. Hmmm, on screen touch keyboard? - I've worked on quite a few products with these in them - if Apple wants to give me ring, maybe I can help them out! I guess Apple could counter-sue the patent based on this if it's worth the time. Sometimes it seems to me all this little companies file generic patents just to have an asset to make money out of. How did this company use the patent? In which products has it been implemented? These are the questions that one has to answer. I am in favour of protecting innovation, but sometimes this whole story just gets out of hands, at lately much more so. "Let us prepare a generic patent (a net) and wait and wait... Sooner or later (7 years) a big fish will be trapped". This of course is just an opinion based on the article I did read. But it nevertheless seems to get more and more ridicuolous. I didn't produce anything but I will be able to sue everyone around and get "right compensation". Patenting is not a way to make money in itself, it is just a way to protect one's research and development. But far too many "fishers" depend on these nets to get their paycheck (including lawyers). It's always seemed strange to me that a case can be taken to a court in a completely unrelated state. I would have thought it would make sense for a Florida based company to have to file the suit in Florida. But then again, I have absolutely no knowledge of American or patent law. I'm pretty certain the Supreme Court has tried to nip this problem in the bud. A company has to show that it's current operations are at risk by the alleged patent violation. Or something like that. This way, you can't just have a shell company that holds unimplemented patents for the purposes of suing every large company in sight. Even if my recollection is close to accurate, this won't stop such a company from filing the suit, especially in districts where judges are more friendly to hearing these shell companies out. Apparently, Tyler, Texas, whose other claim to fame is an Anheiser Busch plant, is such a friendly environment. I'm not too worried about Apple. They must have the best lawyers in the world. Okay, so in checking out the patent, it seems like the big idea for their technology is having an on-screen keyboard that can't be changed in any way. The iPhone keyboard is static when activated, but the buttons change when you tap on the shift key or the "123" key. It also disappears when you move to a function that does not require text input. It hides, shows, and adjusts itself depending on what you're doing. This is exactly what this silly company's patent is purporting to avoid! It almost seems like they didn't even bother reading their own stuff. Why hasnt this company sued Microsoft,Palm,and HP for their on screen keyboards used in some of the first palms and micosoft and hp's tablet Pc's. Some people are crazy this should be against the law. They're not suing because it's an on-screen keyboard...they even reference previous on-screen keyboards in the patent filing. It's a specific feature of the keyboard that they're suing about. But it still doesn't make any sense to me. Yeah...every now and then these news come up. YUP! The Newton had this from day one! I'm going to dig up something that vaguely looks like maybe I patented this entire thread. Please forward compensation to me immediately, or I'm suing. Correction: Steve Jobs said "...and boy, is it patented" or something very similar. He never said that the whole interface was patented. Surely 200 patents would lead you to believe "nearly every aspect" is safe (including parts of the iPhone that are not the interface. But Jobs never claimed to have patented nearly the whole interface. Sorry to be nit-picky, but there is a difference. Build that border fence on the north side of Texas too. Boycott Texas-no more presidents from Texas.